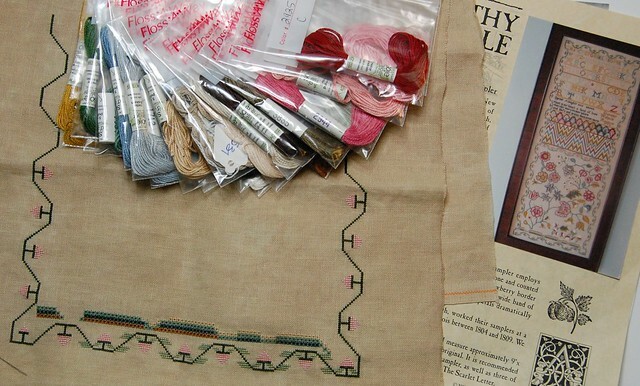 Nicole's Needlework: A New Start! Whenever I have a lot of stress in my life, I like to start new projects. And they can't be small projects - they have to be big! The bigger the stress, the bigger the project. I got it in my head that I wanted to start The Scarlet Letter's Dorothy Walpole. I think Laurie's framed finish put me over the edge! The only problem was that everything was packed away. The linen, the chart and the threads. Well, that didn't stop me for long! I dug them out and started right away. I'm loving it! Unfortunately, I had to frog about half of the border I stitched. Somehow I got off in two places. I'm back on track now and am working on all those eyelet stitches on the bottom. I can't wait to get to the pretty flowers! Only one week until we head down to Florida. I have almost everything packed. I just have to do the kitchen and few other things. I hope you all have a happy and safe Memorial Day weekend! Oh Nicole, what a pretty start. I just adore all those eyelet stitches on the bottom. I love stitching those when they are in a chart. I hope that nasty frog does not pop up again. Such a great start on Dorothy. That is a beautiful sampler. Mine is sitting in the bottom of the stash basket. It probably won't see the light of day for a long time so it will be fun to watch your progress. Boo on those frogs! But I'm loving those eyelet stitches! Glad to hear I helped push you over the edge... Dorothy is a wonderful stitch. Gorgeous stitching you've already done. Love the colors. Oh I see you got The Proper Stitch book. Do you like it? I've been reading lots of good reviews. Wow your moving as well, good luck to you. gorgeous piece you are working on, love it. Das ist ein sehr schöner Start. a great start!! the colors are beautiful! What a very nice new starts! I hope you feeling better soon. Have a nice weekend. That's a lovely new start, excellent choice! Gorgeous new start!!!!! You make me want to start a new project ;-). 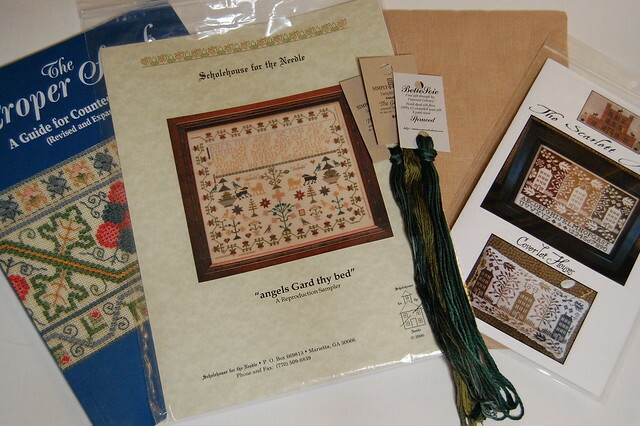 I love those colors in that sampler - the spring-summer palate should be cheering on your move. I agree, moving can be hugely stressful. I seem to look at the whole thing with horror because I don't like tackling little logistics that are all needed to complete a move, but such is life. I hope everything goes smoothly for you! Love your new start! Hope the move goes well. "Dorothy Walpole" is delicious! She looks like such a pleasure to stitch. She's been on my "must have" list for some time, but I keep telling myself "no, no, no" until some WIPs get finished! But that's no fun! Enjoy her ... look forward to seeing your progress. Best wishes with your move. Hope all goes smoothly! Beautiful beginnings! Have a great holiday weekend. Hope your move is uneventful, and that you'll post more than ever so we won't miss you more! Gorgeous start on Dorothy! She's such a beautiful sampler. Nice stash you picked up as well. What a stunning design! I love the colours and the eyelets are amazing!!! Gorgeous start, Nicole! And there plenty of worse ways to deal with stress. Your way actually creates something beautiful! Safe travels Nicole! I know Cari is excited for you to be in Florida! Your Dorothy Walpole is beautiful....I may have to succumb! But not today...HA! Good luck with your move, Nicole! Very pretty start and great stash! I have to do the scarlet too !! Elizabeth J M Mears Finished!